One can see why Braveheart was such a success when it was released in the summer of 1995. First, it was directed by, and starred, at the time one of Hollywood’s bankable action heroes, Mel Gibson, who was famous for his work in the Lethal Weapon movie series. Additionally, it was a historical action epic based on the Scottish man and legend, William Wallace. It also had a universal theme that people could identify with, the struggle of independence from a tyrannical ruler, Edward I, also known as Longshanks in the movie. When the movie was released it made $210,409,945 at the worldwide box office against a budget of $70,000,000. 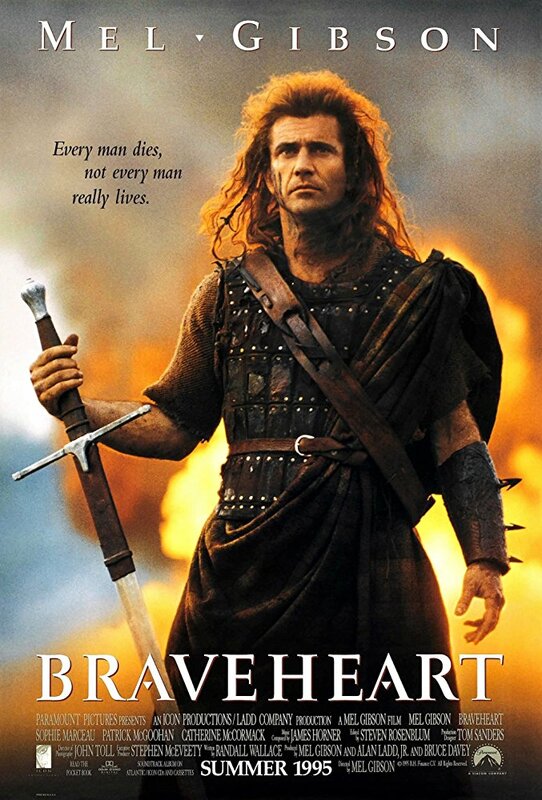 Braveheart was also nominated for ten Academy Awards and won five: Best Makeup, Best Cinematography, Best Director, Best Sound Effects Editing, and Best Picture. It is hard not to like Braveheart. It opens with beautiful shots of the Scottish highlands with bagpipes playing an entrancing song. A narrator opens the movie speaking to the succession crisis Alexander III left when he died without an heir and that Scottish nobles and the English King Edward I are fighting for control of Scotland. During this time, the English murders Wallace’s father and Wallace is left in the care of his uncle, who educates him and travels with Wallace around Europe. Wallace returns to Scotland a young man and falls in love with a woman named Murron. They secretly marry to avoid the new English declaration of Prima Nocte, or the right of a noble to sleep with the bride on a man’s wedding night. Edward I used Prima Nocte to persuade some of his English nobles to uproot and move to Scotland. At the same time, Edward I, Longshanks, is fighting a war in France and marries his son to a princess to build an alliance in France. Meanwhile, the English murder Murron and Wallace starts a rebellion. The first battle is the Battle of Stirling, at which some of the Scottish nobles come in hopes to negotiate peace. Wallace arrives and incites a battle and delivers a humiliating defeat of the English. Then, Wallace and his men take York by force, which gets Longshanks very worried and he sends the French princess to negotiate peace terms. They speak and Wallace agrees he will not move further into England, and she tells him of the upcoming English invasion. Wallace and his men move and are defeated at Falkirk, where the Scottish nobles betray Wallace. Wallace gets mortally injured but is saved by an English soldier, whom Wallace had spared. Longshanks becomes gravely ill and becomes bedridden. The nobles betray Wallace again and he is taken prisoner. The French princess goes to Longshanks and pleads for mercy, telling him that she is in love with Wallace and pregnant with his son. Wallace is given his moment to say his last words, and Wallace screams “Freedom”. Braveheart is very entertaining, but not historically accurate. Edward I was not, despite what the film would have you believe, a pagan, and Scotland and England coexisted relatively peacefully before Wallace’s uprising. The war only started because the Scottish vassal put in place by Edward I spurned Edward and entered into a treaty with France. It was then that Scotland invaded England and then England, with its superior army, retaliated. Prima Nocte was never a practice implemented by Edward I. Additionally, Wallace was not a commoner, but rather a member of a small noble Scottish house. Robert the Bruce did not get involved until 1306 and he ended up leading the rebellion until 1328 when the Treaty of Northampton was signed and he became king. Most of the movie is based on the Scottish epic poem called The Wallace written by Blind Harry. Most of this movie is based on legend rather than fact. I found it very enjoyable film and thought the message of independence was very moving. 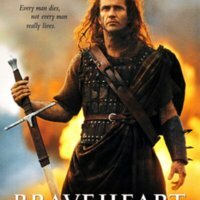 Christopher Mangine, “Braveheart (1995),” Medieval Hollywood, accessed April 24, 2019, http://medievalhollywood.ace.fordham.edu/items/show/19.